Arrive in Delhi. Personal welcome at the airport. Transfer and overnight at the Hotel Oberoi, belonging to one of the most luxurious Indian hotel chains known for its premium service. Perfectly reflects the spirit of Delhi, the hotel is a harmonious blend of tradition and sophistication. Full day tour of Delhi, capital of India with a fascinating history and dynamic present. Old Delhi, the ancient city of the Mughal sultans steep streets teeming with people and New Delhi, the capital of the Indian Empire with wide tree-lined avenues designed and built by the British Edwin Lutyens as a garden city. First, Old Delhi visit the Raj Ghat, the site where Mahatma Gandhi was cremated; Jama Masjid, the largest mosque in India; visit the Red Fort which was once the most opulent fort and palace of the Mughal empire and the bustling shopping district of Chandi Chowk. Then Visiting New Delhi Qutb Minar minaret, the tallest minaret in the world. Then Connaught Circus, the heart of public life in New Delhi, Rajpath and India Gate, Parliament and President House. In the late afternoon, transfer to the airport and flight to Udaipur. 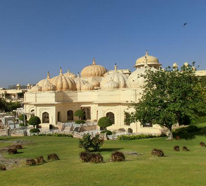 Arrive Udaipur and transfer to hotel Oberoi Udai Vilas majestically situated on the banks of Lake Pichola. Built between three lakes and green hills, the Pearl of Rajasthan was founded by Udai Singh II in the 16th century. Town with small and lively streets, whitewashed houses and ornate balconies make Udaipur one of the most beautiful cities of India. Visit the City Palace, this huge palace, Rajput and Mughal mixture of influences surrounded by crenellated walls. Imperial with its facade of 250 meters long and over 30 feet tall, it consists of several palaces, courtyards and ceremonial sumptuous apartments decorated with finesse. Then, Jagdish temple built in the 16th century and dedicated to Lord Vishnu, the largest and most beautiful temple in the city. Then, Sahelion Ki Bari, the garden of bridesmaids, where loitering ladies of the royal family, away from prying eyes. In the late afternoon boat ride on Lake Pichola followed by a served in the Crystal Tea Gallery which houses a sumptuous collection of crystal objects, unique collection. Dinner on the island of Jagmandir in the sumptuous surroundings of a 17th century palace. Overnight at hotel Oberoi Udai Vilas. Morning drive to Jaipur and explore the capital of Rajasthan. Jaipur, or the Heart of Rajput chivalry, built in 1727 is known as the "Pink City" because of the color of its walls. The city is famous for its manufacturing of silk carpets and work on marble. Jaipur is also the city of gems and many international jewelers recognize the professionalism of its jewellers and high quality precious stones. In the afternoon, visit the City Palace, still occupied by the current royal family of Jaipur, and sumptuous museum containing many treasures. Then, the astronomical observatory built in the 1728 by an astronomy enthusiast prince. Appreciate the beauty of Palace of Winds, Hawa Mahal, containing hundred of niely carved windows which allowed the ladies of the court to watch the royal processions. From the palace, leaving only the high facade rose five breakthroughs galleries nearly six hundred moucharabiehs. Installation Oberoi Raj Vilas in mixing elegance and attention to detail. Hotel among the finest hotels in the world, The Oberoi Raj Vilas relive the splendor of the legendary princes Rajputs. Morning excursion to Amber and splendid fort atop a rocky outcrop. 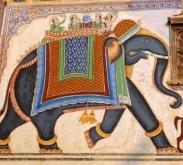 Amber, the former capital of Rajasthan, is available on elephant back. It's a maze of walls and towers that were a warning and incomparable defense system for its time. Visit the fort and its many palaces. Back to Jaipur and then in the afternoon, ride pedicabs in the old city full of markets, colorful bazaars and wisely aligned streets under the arches along the shopping avenues. Typical neighborhoods did not lose this special atmosphere there for centuries. By late afternoon, towards the immense and mythical cinema of Jaipur, the 'Raj Mandir' for a surprising meeting Indian film version of "Bollywood". Overnight at dreamy Oberoi Raj Vilas. Start in the afternoon to Ranthambore. Located near Sawai Madhopur, Ranthambore National Park, a former royal hunting ground of the Maharajas of Jaipur, was established in 1955 as a natural reserve to ensure the survival of the tiger and, of course, many other species that sustain this large predator. The park offers beautiful scenery of lakes, hills, bush and forests, covering an area of ​​nearly 400 square kilometers. Overnight at hotel Vanyavilas nestled in the middle of a wilderness bordering the jungle. Day safari in the park (one in the morning, one in the afternoon) in a small open truck off-road (not privatized). Overnight at hotel Vanyavilas. In the morning, towards Bharatpur and more specifically, Keoladeo Ghana National Park known as the Bharatpur Bird Sanctuary. 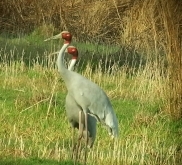 The park is one of the finest bird sanctuaries in the world. Originally, in the 19th century, the lands of Bharatpur were flooded by local maharajas in order to create a giant hunting reserve. It remains today the marshes, ponds, wetlands, meadows and woods. Spanning 31 square kilometers, the park has become the winter home to many migratory birds from Central Asia, China and Siberia to breed. Then, drive to Agra and en route visiting Fatehpur Sikri, a splendid short-lived capital of the Mughal Empire during the reign of Emperor Akbar. The city was abandoned shortly after its construction by lack of water. Arrive Agra and transfer to hotel. Overnight at the Oberoi Amar Vilas. At sunrise, visit the famous Taj Mahal, unforgettable mausoleum of white marble inlaid with semi-precious stones, built by Shah Jahan in memory of his wife, Empress Mumtaz Mahal. The emperor, mad with grief and love, made him build this tomb completed after 23 years of titanic work. The Taj Mahal is the result of an immense perfection rarely equaled. Then, visit the Red Fort, an imposing building along the Yamuna River. It is the largest fort in India declared cultural heritage of UNESCO. The emperor Akbar who chose Agra as its capital, rebuilt the existing fort in order to make it a residential palace. In the afternoon, drive to Delhi in the evening transfer to the international airport for the return flight. You will find below our selection of hotels for this trip. Hotels indicative subject to availability. The choice of the type of accommodation is in your hands. You will be able to specify it in your quote. Perfectly reflects the spirit of Delhi, the hotel is a harmonious blend of tradition and sophistication. The hotel has received the National Award for Best Institution Hotelier 5 * luxury hands of the Minister of Indian Tourism. The Oberoi Udaivilas is majestically situated on the banks of Lake Pichola. Conceived as a traditional Indian palace, the hotel has captured all facets: small terraces surrounded by gardens with manicured lawns, fountains, water jet shuddering, lily ponds, pavilions with rounded decorative domes. Like all Oberoi, the setting is beautiful and it's always a pleasure to find this oasis of serenity and harmony return visits. Excellent hospitality and personalized rooms in beautiful gardens, upscale comfort. Excellent restaurants, swimming pool and beautiful spa. A luxurious step but are always discreet. The hotel is nestled in the middle of a wilderness at the edge of the jungle. This is one of the most luxurious resorts in the region. Cascades of fresh water ponds, tents refined extreme comfort. Everything is here for the meeting with the Tiger. Exceptionally beautiful, refined, elegant, racy. Qualifiers are looking for. THE must-Agra, elected several times best hotel in the world. The only hotel that offers a unique and breathtaking view of the Taj Mahal located a few hundred meters. Built in the Mughal style in gardens and fountains, the hotel decoration at the height of refinement you to the time of the maharajas and their splendor.